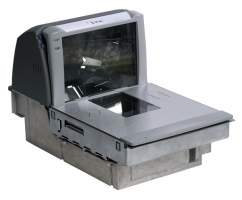 The Magellan 8500 offers the best scan performance of all Magellan scanners Genuine six-sided scanning detects bar codes on any side of the object, even on top. Accordingly, users are not required to examine any goods at all, as the bar code is always recognised regardless of its position on the packaging. This improves POS processes further, as the user simply passes the goods along the scan window to the customer, who hardly can keep up with the speed. Furthermore, the Magellan 8500 is equipped with the patented Omega-Tek scan technology that offers sophisticated training and analysis tools for employee training. Within any existing legal restrictions, the user optimises his own scanning habits with the help of the scanners evaluation, or compares the results with colleagues to reach the same throughput and make sure that optimised and fast scanning is guaranteed even at peak hours. Excellent characteristics and a compact design make the Magellan 8500 the right choice for all POS environments with high throughput. Its omnidirectional field of view detects the bar code from any angle and combines a high success rate with excellent reliability and easy use. The Magellan 8500 offers options for deactivation of secured goods in combination with the required hardware for Checkpoint security labels. Includes a practical multi-interface a single model, yet a variety of interfaces in one - it is configured for the desired interface according to the connected cable - USB, keyboard wedge or RS232. A large number of emulators for various POS and industry protocols are available. React to systems changes simply by exchanging the cables- it is not necessary to change the scanner anymore. Extensive accessories and a complete range of spare parts offer high flexibility during installation, as well as a safe investment.